A slow leisurely morning, God, then on into Church, and afterwards we had a nice visit with Fred and a surprisingly enjoyable “picnic” brunch with people we got to know over the food. Then home to a long relaxing nap . . . aaaah. And now sitting at Your feet, listening to Iz sing Over the Rainbow. . . Freed from work . . . freed from doing . . . freed to drift . . .
How could I have failed for so long to embrace this Gift from You? That is a KEY QUESTION, isn’t it, God. Why, indeed. Because my Time & Place reinforced DOING and ACCOMPLISHING? Because I was susceptible to PRODUCING? Certainly those are factors. Another factor is that it takes a lot of Discipline and Planning to even sort of get ready to Enter Into Your Rest. Today I was not ready but I was so tired and needy from a week of working harder than usual that I knew I had no real choice. No choice but to TRUST YOU? Oh, my. Dear God, I feel remarkably slow and blind. Ah well. I am loved AS I AM. How lovely to realize that Slow and Blind don’t matter! Ah, now THAT is freedom! THAT is an AMAZING GIFT. 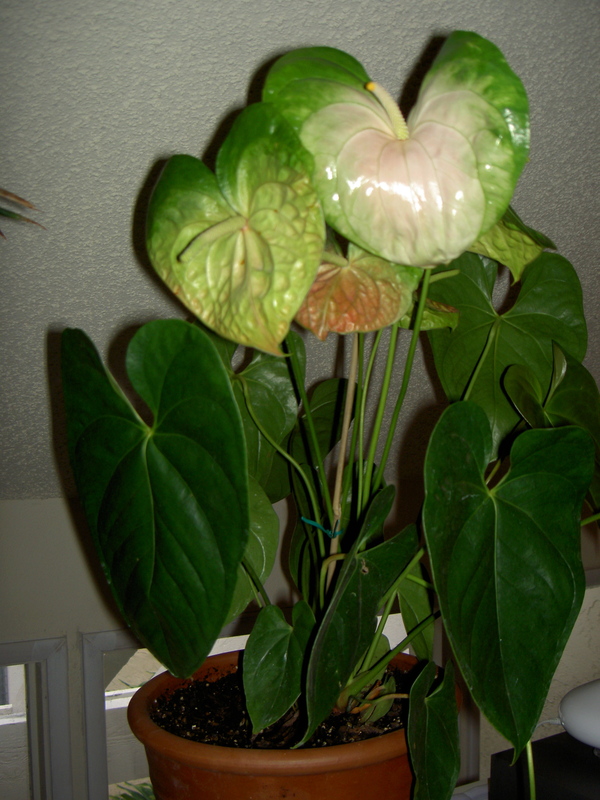 In a sense, the pot of anthuriums pictured above is an image of what my Well Tended Life would resemble. Hee hee! I should go and take a photo of my raggedy anthuriums that live down in the car port — and post it so I can see myself as I am — Not YET as WELL TENDED as I shall become! Let me rephrase that: As Well Tended as I shall become WITH YOUR HELP. You are loved just as you are. I have found that feeling after 10 years living at Arcadia. I do not have to impress anyone. I do have to listen to such advice as “you are doing too much”. God, I need a lot of help with that one! God, if you can assist me in letting go of the things I create for my self to do. I need so much help there. Perhaps, now that my feet are on the ground and I am able to be openly proud of what I have done, God, please help me sit down and be with you.